Silky and light with just enough creaminess to elevate a humble vegetable. 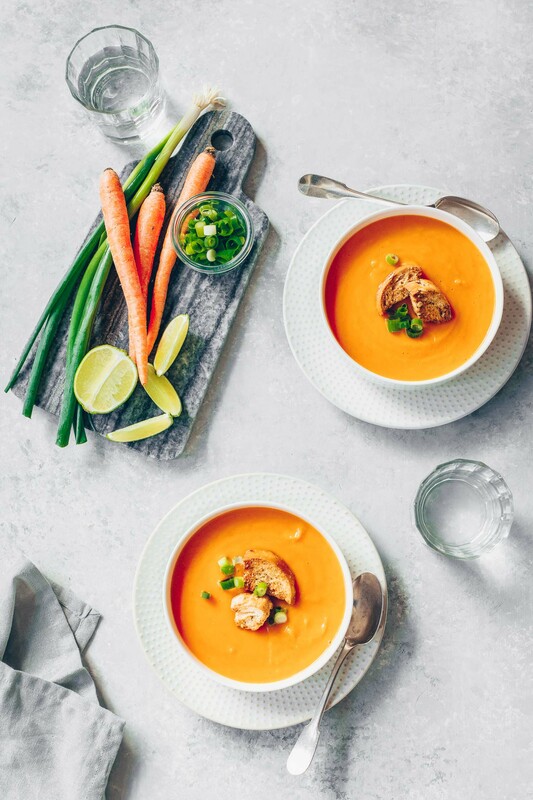 Though subtle Asian touches play a supporting role, the carrots remain the star in this simple but winner of a soup. My husband was a serious skier for many years. I’ve heard all the stories of skiing off-piste, the neck-deep powder days, the times he and friends have had to hike out of tough conditions. Skiing was a big part of his life and by the time I came along nearly twenty years ago he had been on several European ski tours with his group of equally avid skier friends. I learned to ski during our courtship and some of the most magical experiences of those early times were those ski trips to Europe–Zermatt, Kitbühel, Courchevel, St. Moritz, to name just a few destinations. My first trip with the ski group took place just a year after we met–living a hundred miles apart food and cooking had not yet begun to weave themselves into the fabric of our relationship. From regular phone conversations I knew he prepared tacos most nights and weekend dinners together revealed that he enjoyed pasta as much as I do. It was those two-week stretches of travel that provided a better glimpse into my husband’s gastronomic personality. At breakfast where I predictably made a beeline for the eggs and bacon my husband was religious about his fruit, plain yogurt and steel cut oatmeal (it remains his top breakfast choice today). At lunch or aprés-ski when I would order a big plate of spaghetti bolognese if it was on the menu–it always was–he would order a sandwich or salad. Dinner was the most revelatory time. The evening meal was always a touch fancy, a multi-course affair. If the amuse-bouch served was foie gras my husband and most of our dining companions passed their little plates over to me. They’d patiently sip their wine and nibble on bread while I stuffed myself with duck liver. The soup course was when my husband’s eyes would begin to light up. The soups served at these meals tended to be French-style puréed vegetable soups, simple but refined. Silky and smooth, just enough creaminess to add substance, whether it was mushroom or carrot or leek, my husband loved them all. 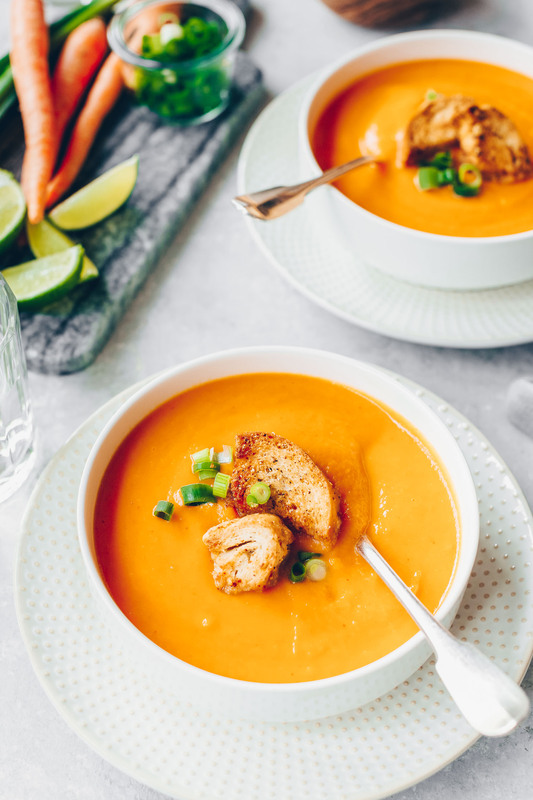 This simple Thai-style carrot soup that I prepared out of an abundance of unused carrots in my crisper drawer is an homage to those early days. 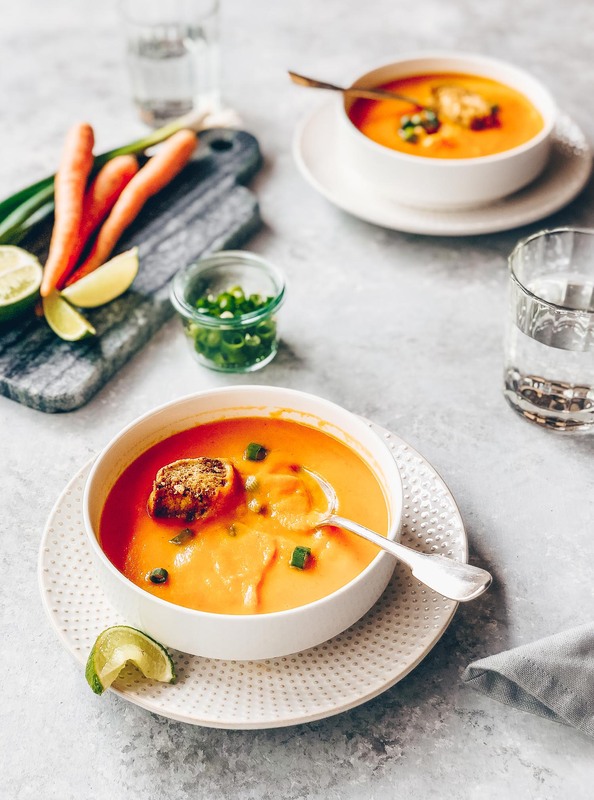 A pound and a half of carrots cooked in broth, lightly flavored with Thai red curry paste with just enough creaminess from light coconut milk to give it some weight, the humble vegetable remains the star. The carrots lend a very subtle sweetness offset by the soft kick from the Thai red curry. 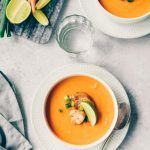 The coconut milk is not dominant here but if you like a richer soup, this recipe is flexible enough to be adapted to your preferences. My husband walked in the door just as I finished preparing this soup for lunch. I was contemplating the addition of fish sauce and lime juice as I wasn’t quite convinced that it was good enough. I had also just brushed my teeth so my taste buds weren’t reliable. “Is it seasoned enough?” I asked. How fortuitous that I thought to ladle these portions for pictures so I could share this recipe here. By the time I returned to the kitchen, my husband’s bowl was not only empty, so was the pot! I enjoyed my one bowl of carrot soup after my mini photo session and my husband still had enough room to polish off the contents of the second bowl. Was this a sign that I’d been neglectful of preparing the soups he loved from our alpine adventures? I’ll take his enthusiasm as a yes and even though we haven’t skied in Europe for many years, I’m happy to have been able to bring back a piece of that special time. While we love this soup for its simplicity, feel free to use this recipe as a starting point to suit your taste. If you like a thinner soup, add more stock. If you want it richer, use regular coconut milk. Squeeze some lime juice for some brightness or add ginger for another layer of flavor. Make it your own. Heat two tablespoons of olive oil in a pot over medium-high heat. Add the onion and a generous pinch of salt and cook until the onion is soft. Add the curry paste and onion powder and cook for four to five minutes until the curry paste is fragrant. Add the carrots and stock. Bring to a boil then lower the heat to medium or a moderate simmer. Cook until the carrots are tender, fifteen to twenty minutes. Add the coconut milk, stir and cook for a minute or two. 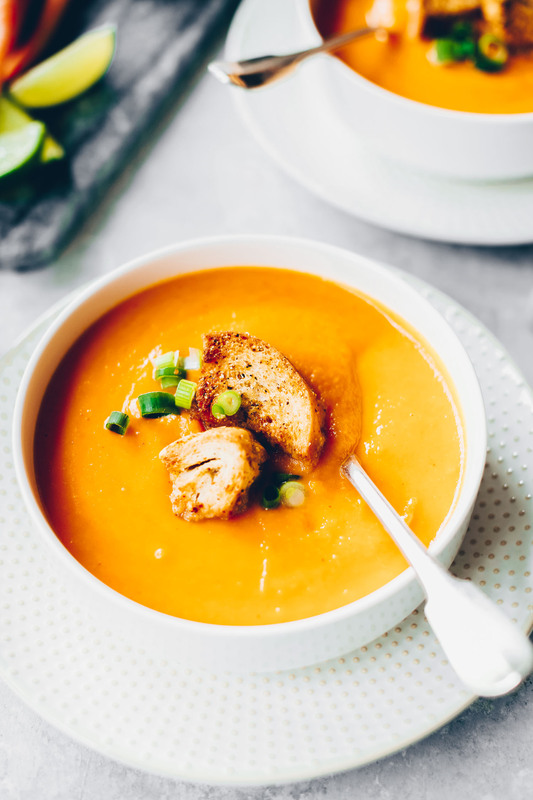 Use a food processor or immersion blender to purée the soup until smooth. Taste for seasoning. If you want a looser soup, stir in more stock. If you want a richer soup, stir in more coconut milk. 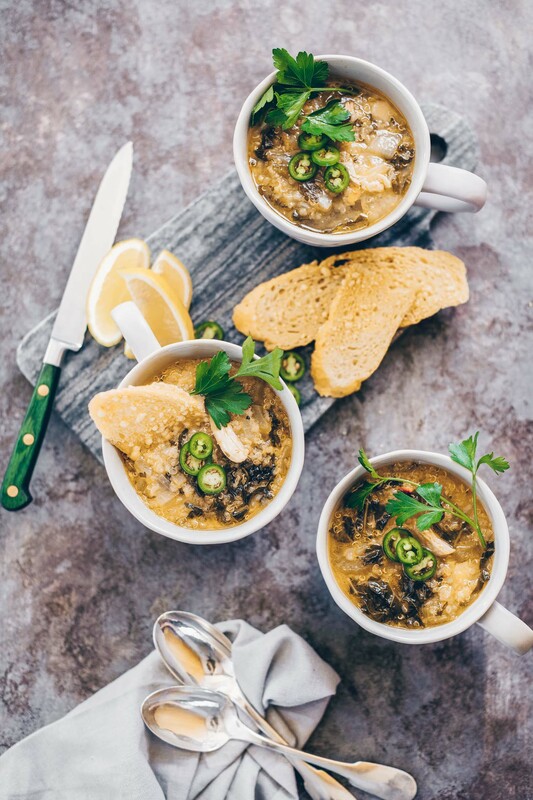 Ladle into bowls and garnish with green onions and lime wedges. 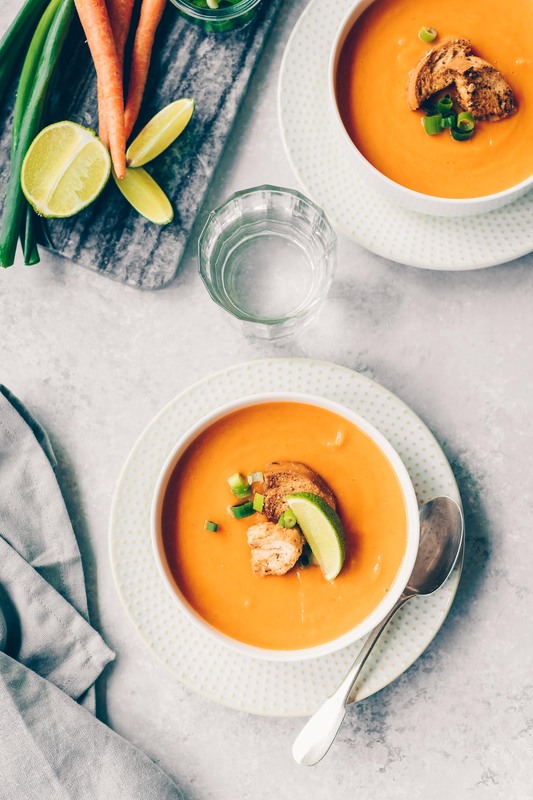 The lime is optional but adds a little brightness to the soup. Stock: I use Swanson’s Low Sodium Chicken Stock for this recipe but use your favorite vegetable stock to make this vegetarian/vegan. What a lovely story! I’d be eating the foie gras as well, and every body else’s portions! A lovely soup, and I like that it’s not too coconutty. Then it’s not just an in your face Thai soup, and a thai inspired carrot soup! I have to say that you are right about soups in Europe. They are usually pureed vegetables, creamy and delicious. Your recipe sounds like one my husband and I would both enjoy.